The following documentation is for developers wishing to write OMERO client code or extend the OMERO server. Instructions on downloading, installation and administering OMERO can be found under the System Administrator Documentation of the main site. 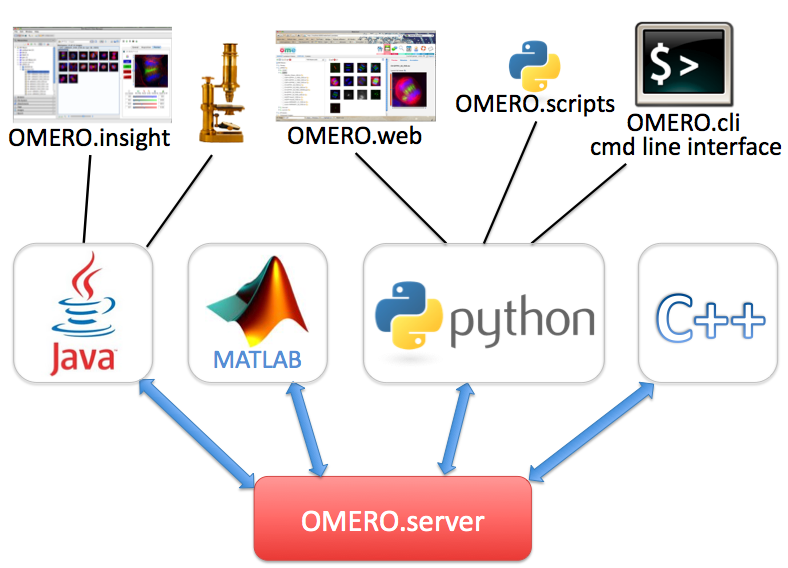 OMERO is an open source client/server system written in Java for visualizing, managing, and annotating microscope images and metadata. The OMERO Application Programming Interface allows clients to be written in Java, Python, C++ or MATLAB. OMERO releases include a Java client OMERO.insight, a Python-based web client OMERO.web and the OMERO Command Line Interface, which also uses Python. There is also an ImageJ plugin. OMERO can be extended by modifying these clients or by writing your own in any of the supported languages (see figure). OMERO also supports a Scripting Service which allows Python scripts to be run on the server and called from any of the other clients. OMERO is designed, developed and released by the Open Microscopy Environment, with contributions from Glencoe Software, Inc. OMERO is released under the GNU General Public License (GPL) with commercial licenses and customization available from Glencoe Software, Inc..
For help with any aspect of OMERO, see details of our forums and mailing lists. OMERO can be extended by modifying these clients or by writing your own in any of the supported languages. © Copyright 2000-2013, The Open Microscopy Environment. Last updated on Oct 15, 2013. Created using Sphinx 1.1.3.